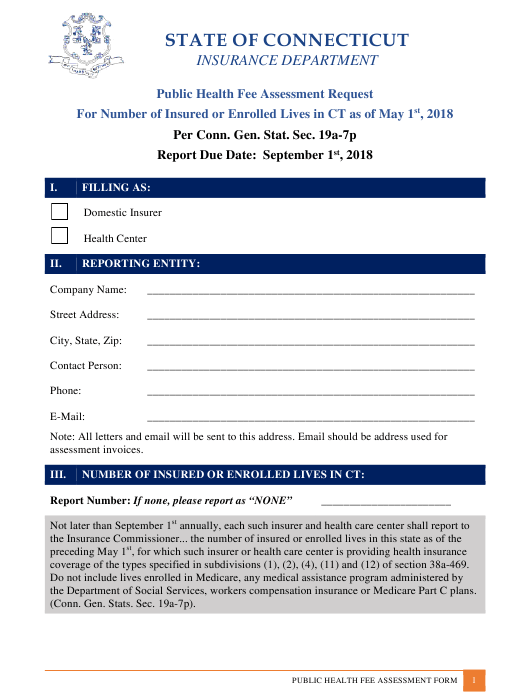 This printable "Public Health Fee Assessment Request" is a document issued by the Connecticut Insurance Department specifically for Connecticut residents. coverage of the types specified in subdivisions (1), (2), (4), (11) and (12) of section 38a-469. the Department of Social Services, workers compensation insurance or Medicare Part C plans. (Conn. Gen. Stats. Sec. 19a-7p). Original ink signature not required. Emailed copy is the preferred reporting method.